Today, more than ever, HCAHPS1 funding is being considered as a viable source of revenue for hospitals, their CFOs taking into account both preventable funds lost and potential funds gained. The opportunity to improve reimbursements—which typically equal about $2M for the average healthcare facility—creates added pressure for Chief Nursing Officers. Hospital executives face the challenge of ensuring patient safety while at the same time managing a facility’s clinical workflow and financial stability. Many hospitals are discovering that effective patient-staff interaction is a key factor in HCAHPS scoring. To that end, Press Ganey has stated that the “single most effective strategy for improving performance in patient experience is purposeful hourly rounding by nursing staff.” An oft-cited Studer Group study alludes to this same point by demonstrating the positive effects of nurse rounding on the following: patient satisfaction, fall reduction, and call light reduction. Indeed, many, if not most, of the hospitals have already integrated some type of hourly nurse rounding protocols. October 1, 2013 marked the 1-year anniversary of the Value Based Purchasing (VBP) program. The VBP program was established by the Affordable Care Act (ACA) as an incentive for hospitals to increase patient satisfaction and standards of care with a “pay-for-performance” initiative. The program measures patient satisfaction through patient experience surveys (HCAHPS). Based on these survey scores, the Centers for Medicare and Medicaid Services (CMS) is able to administer either incentive payments or penalties to a hospital, based on high or low HCAHPS scores, respectively. In its first year, the VBP program is expected to withhold almost $1 billion in hospital penalties. In addition, research has shown a positive correlation between low HCAHPS performance and above average patient readmission rates. To reduce readmission rates, the ACA has established a “Hospital Readmission Reduction Program” to provide significant financial incentives. The penalties for excessive rates were up to 1% of a hospital’s Medicare DRG payments in FY2013, with subsequent increases to 2% in FY2014 and 3 % in FY2015. When the integrity of data collected lies in the use of manual log sheets for rounding verification, it can be challenging to quantify these log sheets and validate their accuracy. This, in addition to the difficulties associated with implementing, monitoring and sustaining hourly nurse rounding procedures can threaten patient safety and satisfaction, negatively impacting HCAHPS scores. Furthermore, HCAHPS vigilance is oftentimes a subjective exercise and one that takes place in hindsight, driven by patient problems. 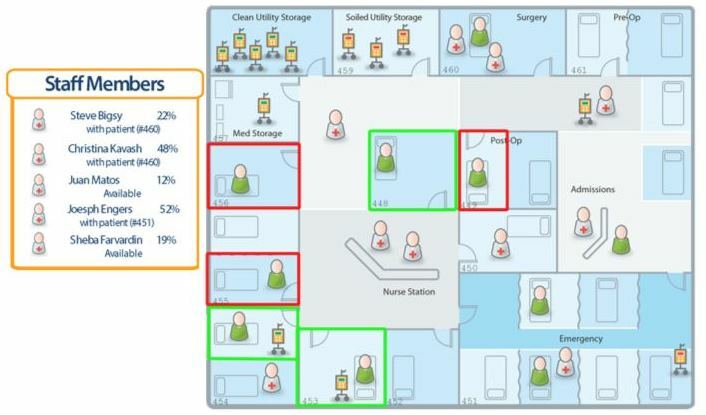 Solutions like CenTrak’s real-time locating systems (RTLS) help to automate clinical workflow, helping hospitals objectively monitor Nurse Rounding. This automation ensures nursing protocols are adhered to consistently. RTLS provides a proactive approach for healthcare facilities, allowing staff to react to unfavorable patient care situations in a timely fashion. For example, a solution can incorporate the hospital’s nurse rounding protocols; should a nurse miss a rounding event to a patient room, an alert would be sent following a pre-set escalation path. Detailed reports showing dates and times of patient interactions are generated automatically, and when necessary, the system will suggest which, if any, corrective actions must be taken and by whom. Visibility to staff & patient location, down to bed- and chair-level accuracy. To learn more about how this solution can help you, please contact marketing@www.centrak.com. The American Journal of Nursing, “Effect of Nursing Rounds on Patients’ Call Light Use, Satisfaction, and Safety”, September 2006, Vol. 106, No. 9. Press Ganey: Performance Insights, “The Relationship Between HCAHPS Performance and Readmission Penalties”,2012. 1The HCAHPS (Hospital Consumer Assessment of Healthcare Providers and Systems) survey is the first national, standardized, publicly reported survey of patients’ perspectives of hospital care.